60. 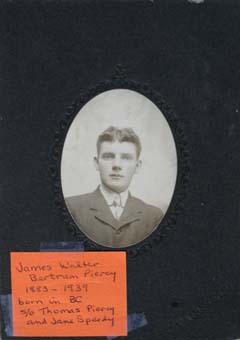 James Walter B. Piercy. Son of Thomas H. Piercy & Jane Speedy. Born 8 Feb 1883 in B.C. Died 30 Nov 1939 in Vancouver, B.C. 2988. Undated portrait photograph of James Walker Bertram Piercy (1883-1939) born in B.C. Son of Thomas Piercy and Jane Speedy. Source: Darrell Messer, Harvey, Rephotographed by Tim Patterson. 26 Jul 2007.